Editor's note: We want you to know what's happening, why and how it could impact your life, family or business, so we created a weekly digest of the top original immigration, migration and refugee reporting from across VOA. Questions? Tips? Comments? Email the VOA immigration team:ImmigrationUnit@voanews.com. The comments followed a bombshell report by The Washington Post that the administration had twice sought retribution against political rivals who were unwilling to support Trumps request for border wall funding. According to the report, U.S. Immigration and Customs Enforcements legal department had rejected the proposal. It was a shake-up that caught the department by surprise, just as it was preparing to release March data on southwest border apprehensions the highest figures to date under the Trump administration. As VOA reported this week, the moves suggest broader changes are in order for the department. 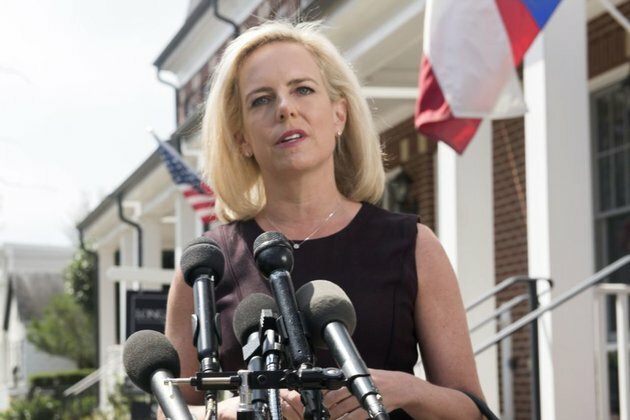 The announced appointment of U.S. Customs and Border Protection (CBP) Commissioner Kevin McAleenan to replace Nielsen as acting DHS secretary suggests a doubling down on policies may already be underway. The U.N. refugee agency said 88 civilians were killed by Boko Haram in Nigers border areas in February. The spike in deadly attacks against civilians is increasing in frequency and intensity, UNHCR said, forcing more than 18,000 people to flee their homes. VOA reported that women and children in particular were experiencing extreme trauma as a result. On Ellis Island, the names of 775,000 immigrants are engraved across 770 stainless steel panels including recent arrivals from Central America and Southeast Asia who never set foot on the former processing station.